Darius was honored with the ACM Gary Haber Lifting Lives Award last year for his efforts and will receive the Harry Chapin Memorial Humanitarian Award at the upcoming 2019 Music Biz Awards. He made a commitment to support St. Jude Children’s Research Hospital specifically in 2008 after touring the facility known around the globe for treating childhood cancer and other life-threatening diseases. 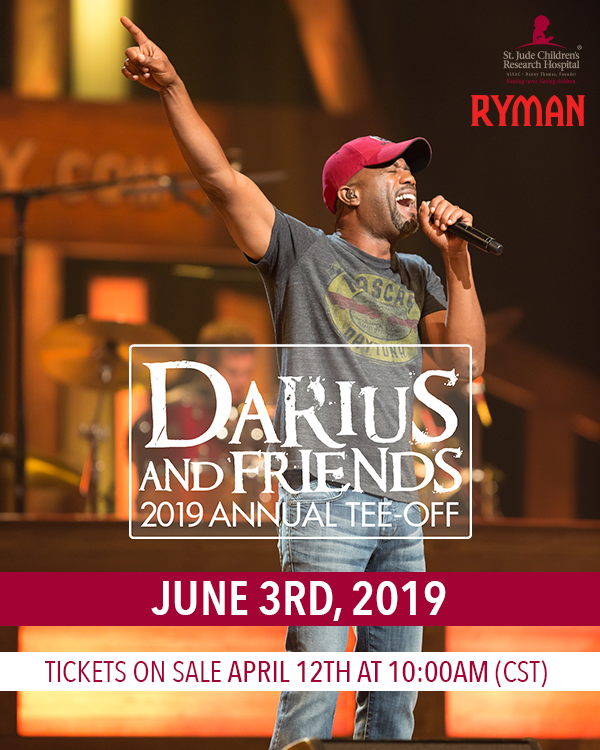 Friends performing with Darius in past years have included Lauren Alaina, Brooks & Dunn, Luke Bryan, Luke Combs, Randy Houser, Charles Kelley of Lady Antebellum, Ashley McBryde, A.J. McLean of the Backstreet Boys, Brad Paisley and Kenny Rogers, among others. The lineup for this year’s event will be announced soon.